It’s doubtful anyone can prove a direct link between “movie violence” and the abhorrent level of murder by guns in the US. But it is certainly part of the reinvigorated and broader debate on gun control following the horrifying mass murders at the Newtown Elementary School – an issue caught in the “cultural violence” element of the debate that also includes video games, television and the like. 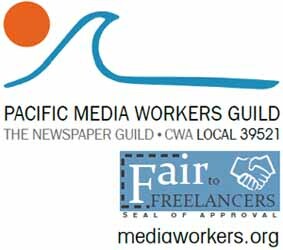 SF Weekly editor Tom Walsh was terminated with immediate effect Thursday, confirmed Todd Vogt, co-owner of the San Francisco Newspaper Company, the parent company that previously added the SF Examiner daily in 2011 and the SF Bay Guardian weekly in 2012 to its ever-expanding acquisitions portfolio. According to the mission statement of Pacifica, we would be wrong to base all of our programming decisions on who makes the most money during the morning drive time or which show raises the most money. We actually have a mission; to give voice to the voiceless. This month, KPFA is going through what will probably prove to be one of the most important elections of its 10-year experiment with democracy. Paying attention to digital security is no longer an option. Every reporter should know how to protect their digital communications and guard the information on their computers, to make sure nothing inadvertently falls into the wrong hands. On a trip to visit family in Seoul in April, I was approached by a man and a woman who claimed to be North Korean defectors. They presented me with a DVD that recently came into their possession and asked me to translate it. They also asked me to post the completed film on the Internet so that it could reach a worldwide audience. The collapse of print media, combined with the rise of the Internet, has contributed to a boom in citizen journalism and blogging, as well as layoffs of thousands of newsroom staffers as advertising dollars have vaporized.